Rea Vaya is still open for business, despite another round of violent opposition. Photo by Shine 2010 - 2010 World Cup good news. Today’s introduction of the remaining Phase 1A routes on the Rea Vaya bus rapid transit (BRT) system in Johannesburg, South Africa was preceded by more violence last Friday. In two separate incidents, gunmen opened fire on BRT buses, leaving at least seven people wounded and, tragically, one dead. 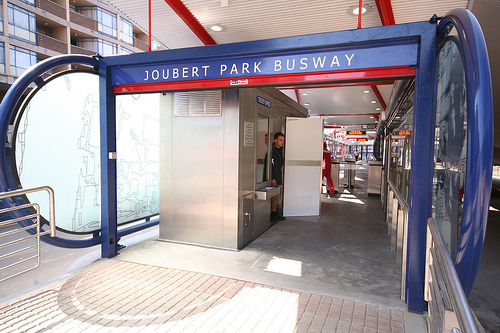 With the introduction of two new Soweto feeder routes linking outlying neighborhoods with the terminal station on the BRT trunk route, inner city circulator routes and two new stations, Phase 1A is now 95% complete. To read more about Rea Vaya’s controversial history, see our previous posts here and here.